On March 5, 2008, I was birding at the Metro Park in Panama City with George Armistead, José Pérez (of Canopy Tower), and several Field Guides group participants. At one point mid morning, we encountered an active, small empidonax flycatcher calling in a small clearing there. The bird was giving a snappy "whit" note which immediately reminded me of Least Flycatcher. So I said, "oh, it's a Least Flycatcher." 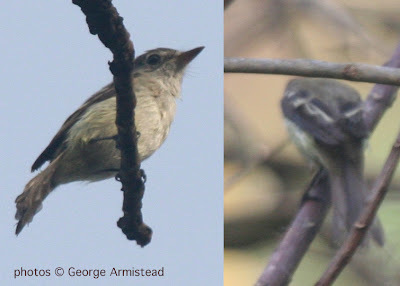 Both George and Jose were surprised and suggested it might be something else, owing to the fact that Least Flycatcher is meant to be rare in Panama. So I simply said, "well, it sure sounds like a Least Flycatcher." We were able to get a quick view of the bird which confirmed in my mind that it was indeed this species. The bird was in tattered, worn plumage, but was distinctively small and drab, lacking any strong greenish or yellowish tones. Even in its worn state, it showed a strong eyering and contrasting wing edgings. I was able to get three call notes on 'tape', before the bird moved off. I played some tape of Least Flycatcher song to it, and it flew right in again over our heads, though it did not continue to call. George Armistead snapped a couple of shots to support the recording data. We decided not to continue to take time to document the bird since it was not a real priority for the group. At any rate, I think that the combination of photos and call notes rules out any other potential empidonax candidates. Attached is a composite shot of two images taken by George Armistead.